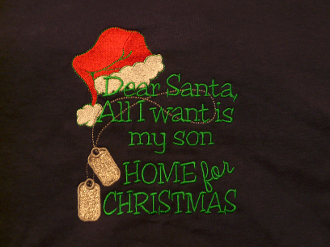 This embroidered Christmas shirt is great for expressing exactly what you want for Christmas. You want your Sailor, Airman, Coastie, Soldier, or Marine home. Because of the thread colors this shirt is only available in a few color choices. You can get it with I want my son or daughter, grandson or granddaughter, wife or husband. and Mommy or Daddy embroidered on the center front of the shirt. So get one for the whole family. This shirt will be awesome for all your Christmas shopping or family adventures including Black Friday, family get togethers, Christmas parades and any time you want to show your holiday spirit. If you have any questions at all please contact us. The turn around for this shirt is about two weeks so place your order soon. The sizes here are designed to fit men or women so keep that in mind when choosing your size. Thanks so much for visiting our storefront. We truly appreciate your business.